On the recent electoral successes of Germany's extreme right and its ideological background. Alternative for Germany supporters march in Berlin. Demotix/Theo Schneider. All rights reserved.A week ago Germany's new extreme right-wing party “Alternative for Germany“ (AfD) celebrated its up to date largest electoral victory, gaining landslide victories in three regional elections. The party jumped from zero to 12%, 15% and 24,4% in the federal states Rhineland-Palatinate, Baden-Wurttemberg and Saxony-Anhalt – by far the largest success of the extreme right since the second world war. Its success can be attributed to surging racism in reaction to Angela Merkel's stance to not close Germany's borders. But the shifting internal processes and ideological positions are far more complex than that. The ideology of the national-liberal wing can be perceived as a form of nationalized neoliberalism on steroids and dominated the party until the Erfurt Resolution of March 2015. It opposes the Europeanization of politics. 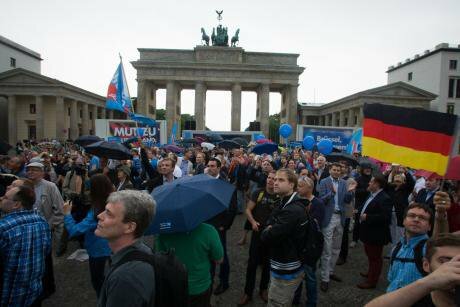 The AfD is a heterogeneous coalition of various ideological streams from national liberalism to traditional conservatism and nationalist populism. Those streams are united by differing degrees of nationalist Euroscepticism and social conservatism. Within these broad, overlapping discursive formations, two wings struggle for ideological hegemony. The first brought together Eurosceptic liberals and conservatives alienated by the fall of the liberal FDP party as well as the strength of Europhiles within Merkel's conservative CDU/CSU. Conservatives despising the cultural modernization of conservative politics and the successive advancement of social rights for women, LGBTQI and ethnic minorities constitute the second stream. The lines between national-liberalism and right-wing populism are evidently fluid, but we should recognize their remaining differences and importance as political formations. The ideology of the national-liberal wing can be perceived as a form of nationalized neoliberalism on steroids and dominated the party until the Erfurt Resolution of March 2015. It opposes the Europeanization of politics in favor of a return to national sovereignty, thereby distinguishing itself from hegemonic currents on the radical left demanding social and transnational solutions to the contemporary gridlock of Europeanization. The national-liberal wing thereby incorporates neoliberalism's demand for (small but) strong states providing order and its social Darwinist discourses targeting the remains of welfare state institutions on the one hand. And on the other it integrates racially charged and imperialist discourses against allegedly less productive southern Europeans to maintain German hegemony within a more nationalist European Union. The Erfurt resolution of March 2015 constitutes the symbolic date of changing power relations within the party: leading characters of the party's right-wing demanded the party to be a “movement of the people against the societal experiments of the last decades (gender-mainstreaming, multiculturalism, educational arbitrariness)” as well as against the “erosion of Germany's sovereignty and identity”, among other things. They also argued for closer ties to the fascist PEGIDA-movement. The following months saw the party's extreme right become more and more dominant. This right-wing populism differs from traditional national-socialism in that it often employs the vocabulary of enlightenment and individualism to attack allegedly barbarian ethnicities. It also often shares neoliberalism's contempt for the poor instead of poverty, but importantly distinguishes itself from it by adopting cultural conservatism beyond neoliberalism's love for social stability. Thus marginalized ethnicities are not perceived as cheap labor to be exploited as long as they do not threaten the social order - their mere presence is already perceived as a social ill to be overcome. Marginalized ethnicities are not perceived as cheap labor to be exploited as long as they do not threaten the social order - their mere presence is already perceived as a social ill to be overcome. Right-wing populist narratives also perceive “genderism“ as an ideology aiming to confuse men and women and thereby destroy the organic unity of the German people. They deem traditional values necessary to reproduce the (implicitly racially purified) German people and thus pivotally perceive women as childbearers for national success. Increasing social rights for women and LGBTI are thus not the product of decades of social struggles, but a “cultural Marxist” conspiracy to infect the national-ethnic body by either dangerous left-wing lunatics (formerly known as Jewish-Bolshevist) or “globalist elites”. Along these lines, structural anti-semitism exists, although less hegemonic so far. The contempt for capitalist modernity vis-à-vis the supposed simpleness of traditional life is testament to this, and so are framings of sinister elites controlling press (“Lügenpresse”), politicians and finance, in more extreme versions planning a genocide against Germany or Europe via mass immigration. In February 2016, Iris Wassill from AfD Munich lectured on so called power elites (“Machtelite”), catering to every single antisemitic fetish from Rothschild, bought media and politicians, George Soros, Federal Reserve to Rothschild, rootless elites, the deliberate destruction of European culture by controlled refugee flows ... to Rothschild. Audience members also learned that feminism is not a form of historical social struggle, but a conspiracy invented by the Rockefellers to destroy society. To be sure, the AfD strongly tries to rid itself of associations with national socialism, from leader Frauke Petry suggesting that the Front National is socialist and thus left-wing – another popular right-wing narrative to rid oneself of historic responsibility –, to former head Bernd Lucke arguing that AfD is neither left nor right. However, such strategies have become increasingly rare with the mentioned move to the (further) right and, perhaps more frightening, they do not even seem to be necessary according to recent election results. A recent poll among AfD members has found that the party base shows striking resemblances to the national-socialist NPD. Indeed, positions are occasionally even more radical than those of the national-socialists, as AfD members do not even want to grant temporary asylum to people fleeing political persecution (in contrast to some streams of the NPD). The AfD is part and parcel of the emergence of twenty first century fascisms, blaming conspiratorial elites and marginalized ethnic and social groups for the contradictions and multiple crises of contemporary global capitalism. Instead of overcoming it towards more social and democratic structures, they want to replace it by a more authoritarian system - constructed in the name of an invented, putatively more peaceful tradition that has never existed.